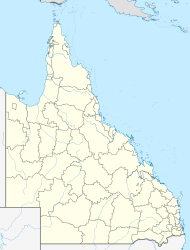 Mount Carbine is a town in Far North Queensland, Australia. It lies close to the Mount Carbine Tableland. It is within the local government area of Shire of Mareeba (between 2008 and 2013, it was within the Tablelands Region). At the 2006 census, Mount Carbine had a population of 91. Mount Carbine Post Office opened by September 1907 (a receiving office had been open from 1906) and closed in 1970. ^ a b Australian Bureau of Statistics (25 October 2007). "Mount Carbine (Mareeba Shire) (State Suburb)". 2006 Census QuickStats. Retrieved 13 June 2011. This page was last edited on 26 July 2017, at 09:35 (UTC).